Love what you do. Love the people you work with. Be proud of where you work. “We focus more on our culture and creative perks so we can offer something to our employees that extends beyond just compensation,” says managing director Jen Dodge. The formula appears to be working. Accounting Principals has ranked as the top company among large employers in the Best Places to Work list four times in the past six years. The professional recruitment and staffing firm includes the company’s Ajilon and Parker + Lynch divisions. Accounting Principals specializes in accounting staffing while Ajilon focuses on corporate office recruiting, and Parker + Lynch’s area is executive search and professional consulting. The company dates back to the 1991 formation of Accounting Solutions, which was sold to Accounting Principals in 2005. In 2010, Accounting Principals became part of The Adecco Group, an international staffing company. Accounting Principles now has more than 75 locations and about 1,000 employees nationwide. The Richmond-area office in Glen Allen has approximately 20 employees. “Our parent company was ranked as the No. 2 most attractive company to work for on Fortune’s 2017 25 World’s Best Workplaces List, so you can see that the tone really does start at the top for us,” Dodge says. Accounting Principals continually solicits feedback from employees on the perks and programs they want. This year the company has initiated the “new normal,” which allows employees increased flexibility in their work schedules when they can get their job done — and get results — with fewer office hours. “This was our answer to try to give more flexibility without sacrificing our strong focus on the quality and service we’ve become known for with our clients,” Dodge says. The company has a strong paid time-off policy. It also offers other programs and contests in which employees can earn additional time off when they exceed expectations. The benefit package includes a wellness perk that helps employees pay for gym memberships, yoga classes and sessions with personal trainers as well as smoking-cessation and weight-loss classes. 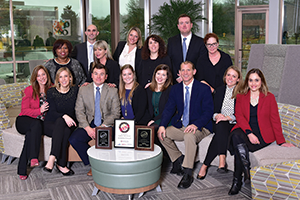 Accounting Principals’ Win4Youth program motivates employees and clients to participate in fitness and sports as a way to raise money for children’s charities around the world.